This conference highlights work by scholars using television news materials to help us understand how TV news presented the events of 9/11/2001 and the international response. Our collective recollection of 9/11 and the following days has become inseparable from the televised images we have all seen. But while TV news is inarguably the most vivid and pervasive information medium of our time, it has not been a medium of record. As the number of news outlets increases, research and scholarly access to the thousands of hours of TV news aired each day grows increasingly difficult. Scholars face great challenges in identifying, locating and adequately citing television news broadcasts in their research. The 9/11 Television News Archive (http://archive.org/details/911) contains 3,000 hours of national and international news coverage from 20 channels over the seven days beginning September 11, plus select analysis by scholars. It is designed to assist scholars and journalists researching relationships between news events and coverage, engaging in comparative and longitudinal studies, and investigating “who said what when.” What kinds of research and scholarship will be enabled by access to an online database of TV news broadcasts? How will emerging TV news studies make use of this service? This conference offers contemporary insights and predictions on new directions in television news studies. Brewster Kahle is the founder and Digital Librarian of the Internet Archive in 1996. An entrepreneur and Internet pioneer, Brewster invented the first Internet publishing system and helped put newspapers and publishers online in the 1990’s. In-depth analysis of television news coverage of the September 11 attacks and their aftermath reveals how these events were fashioned into “9/11,” the politically and morally charged signifier that has profoundly shaped public perception, policy and practice in the last decade. The central argument is that patterned representations of 9/11 in news media and other arenas fueled the transformation of September 11 into a morality tale centered on patriotism, victimization and heroes. The resulting narrow and oversimplified public understanding of 9/11 has dominated public discourse, obscured other interpretations and marginalized debate about the contextual complexities of these events. Understanding how and why the coverage took shape as it did yields new insights into the social, cultural and political consequences of the attacks, while also highlighting the role of news media in the creation, affirmation and dissemination of meanings in modern life. Brian Monahan has extensively researched news coverage of 9/11, resulting in a number of scholarly presentations and a book, The Shock of the News: Media Coverage and the Making of 9/11 (2010, NYU Press). The experience of watching the news on TV as events unfold is often complicated by the space of exhibition — typically, the domestic space. When hour upon hour of news is catalogued and archived — placed in a space of focused study — the news and the experience become altogether different. What was meant to be ephemeral acquires permanence, and what is usually a short-term viewing experience becomes a rigorous, frame-by-frame examination. In this presentation I will discuss how the archive challenges researchers to adopt new ways of seeing and explaining TV news. Deborah L. Jaramillo is Assistant Professor in the Department of Film and Television, Boston University. Marshall Breeding will give a brief overview of the Vanderbilt Television News Archive and how it carries out its mission to preserve and provide access to US national television news. He will relate the incredibly diverse kinds of use that the archive receives, including: academic scholarly research; individuals seeking coverage of themselves or family members that may have appeared on the news in life-changing events; those needing historic footage for current journalism, documentaries or other creative works; or corporations or non-profits researching news coverage of their vested topics. Breeding will also outline some of the constraints it faces in how it provides access to its collection. Marshall Breeding is the Executive Director of the Vanderbilt Television News Archive and the Director for Innovative Technology and Research for the Vanderbilt University Library. Mark J. Williams is Associate Professor in the Department of Film and Media Studies, Dartmouth College. This talk will explore the possibilities and potential of using accessible video news archives in two areas: immigration research in the field of communication and documentary journalism. I will speak of the significance of video news archives in my current film, The Salinas Project, and discuss my continuing research on Latino/as and immigration in the news. Carolyn Brown is Assistant Professor in the School of Communication and Journalism at American University. She produced daily news shows for MSNBC News and Fox News Channel, and has worked as a producer and senior producer in local news in San Francisco, Washington, D.C., and Phoenix. Focusing on television news coverage of the 9/11 attacks, this talk will outline strategies for automatic quantitative analysis of television news imagery. After receiving a PhD degree in Chemical Physics in 1969, Michael Lesk joined the computer science research group at Bell Laboratories, where he worked until 1984. From 1984 to 1995 he managed the computer science research group at Bellcore, then joined the National Science Foundation as head of the Division of Information and Intelligent Systems, and since 2003 has been Professor of Library and Information Science at Rutgers University, and chair of that department 2005-2008. He is best known for work in electronic libraries, and his book “Practical Digital Libraries” was published in 1997 by Morgan Kaufmann and the revision “Understanding Digital Libraries” appeared in 2004. He is a Fellow of the Association for Computing Machinery, received the Flame award from the Usenix association, and in 2005 was elected to the National Academy of Engineering. He chairs the NRC Board on Research Data and Information. What experiential narratives—sensory, aesthetic and political—are invisible to those exposed to traumatic events? 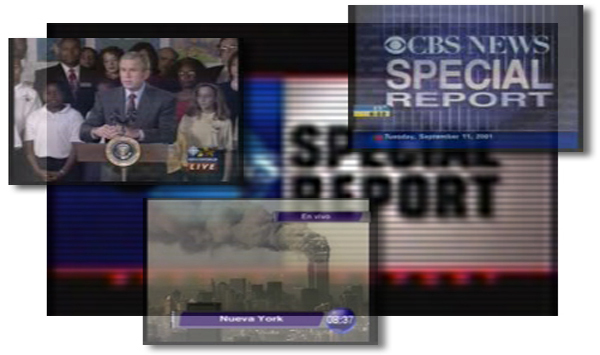 Considering September 11, 2001, the media coverage of the event is predominantly visual. People drift in and out of news footage, covered in dust and ash as they exclaim that witnessing the attacks was like watching a movie . In contrast, the wailing of sirens, the staccato thud of feet running from the stricken towers, and the chaotic overlap of voices break through—sometimes even swallow—the visual narratives spun for 9/11. For contemporary American traumatic events, this inquires into how porous the sensory modalities are in experiencing and remembering shock. How, after all, do sensory representations of traumatic events leave in/visible marks on documentation? I address these questions by exploring sound as an alternate modality, evoking a different level of traumatic indexicality. First, I draw attention to the sensory discrepancy between audio and visual content dispersed for American traumatic events, taking 9/11 as the focal event. By investigating the most highly represented media vehicles in the event—television and radio—I delve into a critical visual-acoustic analysis, looking specifically at FDNY radio transmissions and NY1 Aircheck news footage. Finally, I examine the discursive legacy sound imparts in moments of American crisis from shell shock accounts in the late 19th – 20th century to post-9/11 narratives of post-traumatic symptoms. In delineating this legacy, I hope to reveal the ways in which these documented discourses evolve past preconceived sensory boundaries in the experience of trauma. Beatrice Choi is an NYU MA Graduate from the Media Culture Communication program. She has worked with the 9/11 archives for a year as a Moving Imagery Exhibitions Intern at the National September 11 Memorial & Museum, and recently completed a thesis on Post-Traumatic Landscapes, focusing primarily on post-Katrina New Orleans. Scott Blake has created a flipbook consisting of images of United Airlines Flight 175 crashing into the south tower of the World Trade Center. Accompanying the images are essays written by a wide range of participants, each expressing their personal experience of the September 11th attacks. In addition, the authors of the essays were asked to reflect on, and respond to, the flipbook itself. Not surprisingly, the majority of the essayists experienced the events through news network footage. Blake is distributing his 9/11 Flipbooks to encourage a constructive dialog regarding the media’s participation in sensationalizing the tragedy. To further illustrate his point, Blake conducted a media study using the 9/11 TV News Archive to count the number of times major news networks showed the plane crashes, building collapses and people falling from the towers on September 11, 2001. While best known for his Barcode Art, Scott Blake has created new works that are scandalous, witty, fun, pornographic, humorous and about a thousand other adjectives viewers might use when seeing them for the first time. A self-described “frivolous artist,” he mows over conceptual and visual boundaries to make work that is as thought provoking as it is entertainingly tongue-in-cheek. We thank the many people at New York University and Internet Archive who have helped to make this conference possible. This entry was posted in Event, News, Television Archive and tagged 911, archive, event, television. Bookmark the permalink. This would be so interesting to attend. I was involved in creating a 9/11 Website for employers, which we called Employers Respond. I submitted it to a Library of Congress project. I was very proud of what we accomplished with that site, which subsequently became a model for pushing information out to our subscribers following other kinds of disasters. I recently completed a media study using the 9/11 TV Archive were I counted the number of times major news networks showed the plane crashes, building collapses and people falling from the towers. CNN showed the plane crash 109 times from 9AM to midnight, about once every eight minutes. The BBC showed the planes crashing into the towers 240 times, roughly 16 times per hour. CNN showed the towers collapsing 161 times, or about once every five minutes. CBS was the first to show victims falling from the towers, beginning around noon and replaying the footage 13 times that day. My primary goal is to remind everyone how the mainstream media broadcast the violent attacks over and over, giving power to the very people that wanted to frighten us. I would love to attend this event – however it will be impossible. However, if it is possible to get email updates/summaries of the event – that would be great for those of us who are interested – and cannot attend. This might be so interesting to go to. I had been involved with developing a 9/11 Website for companies, which we known as Companies Respond. I posted it to some Library of Congress project. I had been very happy with what we should accomplished with this site, which subsequently grew to become one for pushing information to our customers following other sorts of problems. Run, come back to correct, I am very sad, in short remind me “to live, to live a meaningful life, cherish every day”, after the thing of the war on terror, to hurt, I feel than911itself is more big. If 0is peace, the 9war. So between 0 and 9have a lot of choices. by the shock waves, wave 1 then wave 2. Pingback: OUPblog » Blog Archive » How do you remember 9/11? FATHER DIED IN IT. IT MAID ME THINK ABOUT IT.SO THANK YOU. IF IT ISNT RIGHT I AM JUST 9 YEARS OLD.